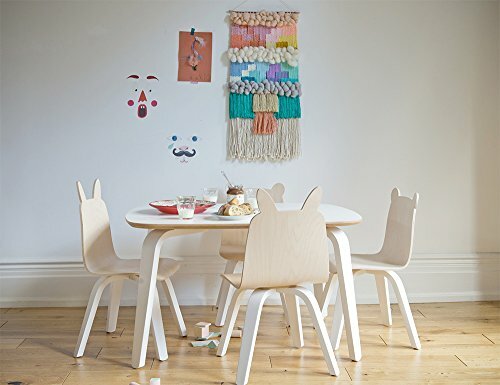 These adorable rabbit-ear and bear-ear chair and table sets are a fun addition to the play room or kitchen that your kids will spend hours on. Oeuf's strong Baltic birch bent plywood has a clean modern aesthetic that will last as your children grows. Optional delightful fabric stickers (sold separately) will inspire kids to personalize them with eyes, mouths, and accessories. These whimsical animal chairs go perfectly with the table as a set and are simple in style but still modern and inventive. This fun-sized table and chair set is durable and easy to clean, making it perfect for hours of playtime. Inlcudes table and a set of 2 chairs. features: Easy to assemble Easy to clean Eco Friendly Made of Baltic birch plywood and Scratch Resistant High Pressure Laminate Finishes are non toxic, water-based and free of VOC health hazards Made under European environmental standards Packaging made of recycled cardboard Responsible recycling through licensed collecting facilities Chair: W: 11.75" D: 10" Seat H: 13.5" Chair H: 24" Table: L: 33.25" D: 27.25" H: 18.25"
Natural and white eco-friendly kids play chairs with animal ears (2) and table. Made of Baltic birch plywood and Scratch Resistant High Pressure Laminate. Easy to assemble and clean: laminate tabletop- wipe down. If you have any questions about this product by Oeuf Nursery Cribs and Furniture, contact us by completing and submitting the form below. If you are looking for a specif part number, please include it with your message.